In simple terms there was but one model of XJ-S at its launch in September 1975, your only choices being from a very limited selection of exterior colour schemes and manual (four-speed) or three-speed automatic transmission. This was the most expensive production car made by Jaguar up to that time, but for your £8,900 you got quite an inclusive package. Only available with the 5.3-litre V12 engine, now fuel injected, the XJ-S also benefited from leather upholstery, electric windows, air conditioning, and alloy wheels all as standard equipment. In terms of performance, with a 150mph plus top speed and acceleration to go with it, it was a match for anything Jaguar had ever produced before, and pretty close to most of the competition. HE front view, with chromed grille and revised rubber-taced impact absorbing bumper bar treatment. 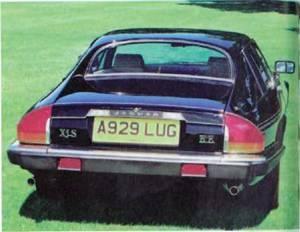 The downsides to the XJ-S were the body style, with its unusual 'flying buttresses' flowing down from the roof to the rear wings, and the lack of brightwork, woodwork, or even rear seat accommodation - and the price, which also reflected in the car's abysmal fuel economy! By 1980 annual sales had dwindled to just over 1,000 cars, which didn't warrant production. The manual transmission car hadn't been popular either. Rear view of HE model showing badging and rubber-faced bumper bar. Jaguar boss John Egan set about improving the concept and build quality of the XJ-S, which was effectively relaunched in 1981 as the XJ-S HE (standing for High Efficiency). The cylinder heads had been redesigned by May, and with improved combustion the V12 was now well capable of up to 20mpg if driven carefully. Jaguar also styled in some more traditional features like chromed topped rubber bumpers (adapted from the Series 3 saloons), a special set of Starfish alloy wheels just for this model, a swage coachline to break up the slab-sided look of the body and, inside, the return of veneer (elm). All this, accompanied by vastly improved build quality, set the XJ-S on a road to recovery and assured it of success second time around. The next move to increase sales was by offering a wider range. 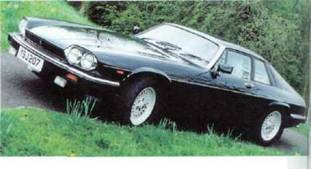 A second XJ-S model was therefore launched with an alternative engine, a brand new 3.6-litre multi-valve straight six unit (AJ6) destined for a new saloon yet to appear, the XJ40. (Like Jaguar's earlier XK and V12 engines, the AJ6 was introduced in a sporting model, the XJ-S, before entering service in a saloon.) Slight changes in the standard of trim enabled the 3.6-litre XJ-S to be marked at a lower price to the top of the range V12 HE. The new model was also offered with a five-speed Getrag manual gearbox (the VI2 being no longer available with any manual option) and was £2,000 cheaper to buy than the V12, offering better fuel economy. The 3.6 manual could even hold its own to 60mph against the larger-engined car. Cabriolet models were introduced in 1984 with targa-top arrangement and XJ-SC badging on the boot lid. Another new model appeared at the same time in an attempt to satisfy US demand for a convertible Jaguar. 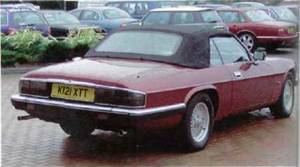 The XJ-S cabriolet introduced in 1983 offered a degree of hand finishing with a rear-section fold-away hood and front targa panels. Launched as a car to special order it was later to become available with the V12 engine as well but was never as popular as anticipated, due to the time it took to open and close the impractical top compared to the fully electrically operated concealed hoods of its competitors. Jaguar eventually totally re-engineered the XJ-S bodyshell to create a proper two-seater convertible, announced at the end of 1987. This top of the range model, initially only available with the V12 engine, was sumptuously equipped with a fully electrically operated hood and even a glass heated rear screen. At £36,000 it was again the most expensive Jaguar you could buy and it was a hit in the US. The XJS convertible from 1988, always equipped with these lattice alloy wheels as standard. There was lots more publicity for the XJ-S in the 1980s of course, with three years in the European Touring Car Championship and the announcement of a sportier XJR-S special edition, initially produced by TWR themselves and later under the JaguarSport name as a joint venture with Jaguar. These cars offered a sports handling kit, improved brakes and engine manifolding, enhanced interior, and an exterior body kit if required. Jaguar also produced limited edition models specifically for different markets, like the Collection Rouge for the USA, and the Le Mans for European markets to celebrate Jaguar's 1988 and 1990 wins. By 1989 more XJ-Ss had been produced than all the E-types ever made, and twice as many as the XK of the 1950s. However, sales started to tumble significantly in 1991 and Jaguar, without an alternative car to offer, re-engineered the XJ-S at a cost of over £50m and renamed it the XJS. This had a virtually entirely new bodyshell, though now easier to produce and galvanised. The overall styling was only subtly altered so as not to damage what was, after all, by now an established and accepted design. With smoothed out lines, improved glass area, a redesigned interior, a new 4.0-litre engine (with, later, a 6.0-litre V12 form as well), the XJS was relaunched yet again. This time there was not only the 4.0-litre coupe and convertible, but a 5.3-litre coupe and convertible and a 6.0-litre XJR-S JaguarSport performance model. After an initial dip, sales rose again in 1993 and 1994, with yet more enhancements, the new 6.0-litre 318bhp V12 engine, changed frontal and rear styling features, and finally, in 1995, the 'Celebration' models to commemorate 60 years of the Jaguar marque and the final demise of the XJS. Limited edition models included the Le Mans car with US-style four headlight treatment. Even in 1996 over 3,000 XJSs were delivered and at the time that its replacement, the XK8, was announced there were few new XJSs around in the dealers to sell. A total of 115,413 had been produced in 25 years, and the XJS had achieved Jaguar's dream of providing the ultimate grand tourer. The facelift model was introduced from 1991 with most body panels replaced. This convertible model shows the revised external look of these post-1991 cars, which at this time retained the rubber-faced bumper bars. Several special editions were produced in the heyday of the XJ-S and many companies then and now produce modified versions, most of which commenced with TWR, the racing firm, for the European Touring Car Championship. It was TWR who produced the original Jaguar XJ-S Sport model, later adapted to the JaguarSport range. 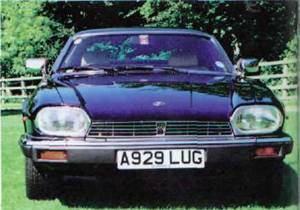 Jaguar also at one time envisaged producing a Daimler XJ-S but only one was produced. A longer wheelbase model was even conceived, to provide more interior space. A limited run of bespoke convertibles was also produced in America from standard coupe models with agreement from the factory. Manufactured by the Hess and Eisenhardt coachbuilding company, they were not only sanctioned by Jaguar but sold to special order through US dealerships. This only lasted until Jaguar introduced their own in-house convertible in 1987.